A minute ago, the score had been 12-11 in the backdoor game-to-go, in conditions where anything could happen on any pass. It was a bleak Cascadian afternoon, mixing rain-soaked tones of green and grey. Coughs and surges of wind came and went. 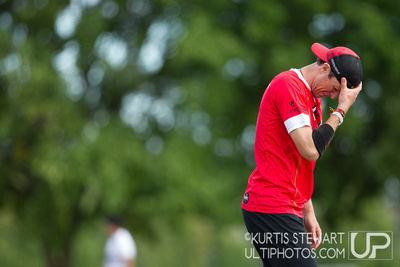 On an unforgiving mistake by Portland’s offense, the score parted open to 14-11 for Furious, and a tide of red-clad monkeys began coaxing the disc back against the wind. Sturdily up to the goal line in steps, one after another, it more closely resembled brickwork than an attack. It was a decisive moment, offering yet another chance at life in a season marked all over by knife-edge survival. Quarter-to-three on a Wednesday afternoon, and even for Furious, this was cutting it absurdly close. The sanctioning of a tournament usually entails a reverentially bureaucratic process not for the faint of heart, which Voodoo and Furious now jointly attempted to compress into most of a day. Few people realized that this moment, transacted over a keyboard, in fact represented the thrilling climax to the Furious season. There comes a point of familiarity at which one learns to wear the absurd with a sort of dashing savoir-faire.